Pea protein (61%), Flaxseed powder (12%), Reduced fat cocoa (8.3%), Fruit and vegetable powder (4%) (Broccoli, Carrot, Beetroot, Kale, Acerola, Spinach, Tomato, Apple, Cranberry, Pomegranate, Orange, Grape, Strawberry in varying proportions), Stabilizers (Acacia gum, Xanthan gum), Natural chocolate flavouring with other natural flavourings, Hemp protein (2.7%), Natural vanilla flavouring with other natural flavourings, Pea starch, Quinoa powder, Marine algae, Sweetener (Steviol glycosides), Spirulina, Sea salt, Pineapple bromelain, Natural flavouring, Natural almond flavouring, Antioxidant (Alpha-tocopherol), Mushroom powder. Best before: see the bottom of the tub. 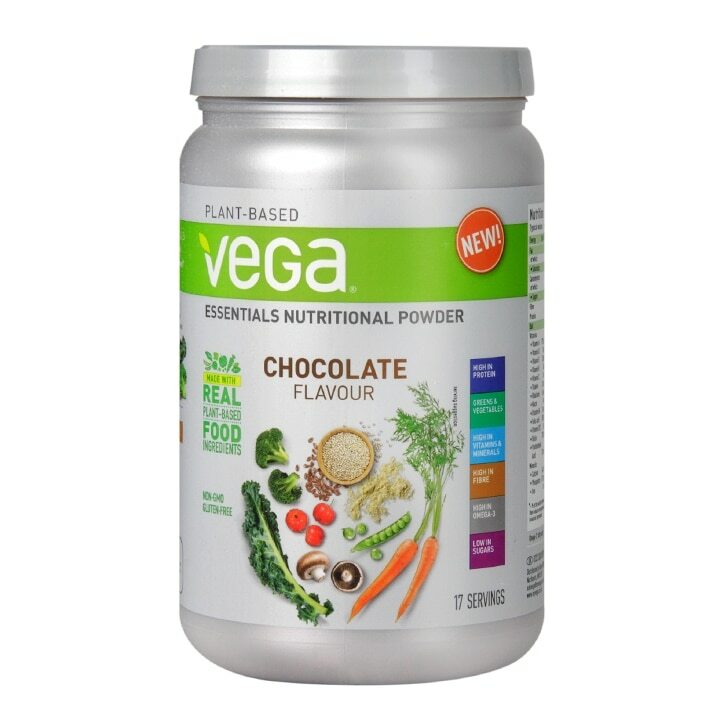 Vega Essentials Nutritional Powder Chocolate is rated 4.5 out of 5 by 45. Rated 1 out of 5 by Lissylou1 from Gone off! We had a very bad batch of vega. Initially the company ( vega) replied to my email instantly and said they would get back to me and send something to compensate. This was 5 months ago. They have ignored my emails asking for them to reply. Bad customer service from vega ( not holland and Barrett) .